Description: Hello everyone I had made this lo of my cousins baby Ava. I found my inspiration from http://www.scrapbook.com/galleries/346549/view/2070277/-1/0/1.html made by Mommyof3littlequeens. When I saw here lo I loved it soo much I asked her if I could use idea and she agreed, so thankful to her. Ava's room is ladybugs and she has a ladybug blanket......her lo reminded me of Ava so here is my version. Ava you are a lovely ladybug!!!! I used the Cricut for the flowers (I had none in those colors so I had to make them) cart geographically speaking on I con for the flower cut at 3/4, 1 1/4, 1 3/4, 2 1/4, 2 3/4. Then layered..then I used stickles on them in xmas red, orange peel, lavender, eucalyptus, turquoise, yellow. I also cut the ring from Cricut at fit to page from tear drop. The title was cut from Hello Kitty font at 1. Beautiful font!! The ladybugs were cut from Xyron Personal cutter on standard. Drew the white on and the black. 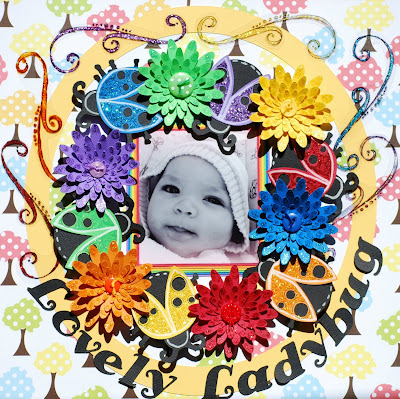 I also used stickles on the ladybugs. The swirls are printed from the computer CKDOODLES at 180 onto Ink jet transparency film by 3M. I then colored in the back with stickles and turned over when dry and glued down with the tape runner. Various buttons, and DMC floss, popdots, and the pp is American Crafts backyard pop. TFL!!!!!!!! THANKS AGAIN Mommyof 3littlequeens. What a beautiful and colourful layout! I luv how all your layouts are so colourful and fun. You did a fab job. Baby Ava is sooo cute!!! Hope the babe is feeling better.